A woman makes a pact with Death in an attempt to be reunited with her late lover. "When I saw Destiny, I suddenly knew that I wanted to make movies," said no less a figure than Luis Bunuel. Yet over the decades since its 1921 release, Fritz Lang's Der Mude Tod (aka Destiny) has faded into the background of his filmography, overshadowed by such later milestones of silent cinema as the following year's Dr Mabuse: The Gambler and 1927's hugely influential sci-fi epic Metropolis. A new theatrical re-release courtesy of Eureka Entertainment offers contemporary viewers a chance to experience Der Mude Tod as it was intended, on the big screen. In the 1920s, anthology films grew in popularity, likely because audiences figured three or four short stories were better value than one long one. Lang's film plays out as one complete narrative, but it follows the classic anthology format of three tales with a bookending sequence wrapped around them. It opens with the death of a young man (Walter Janssen), which coincides with the arrival of a gaunt looking stranger (a magnificently imposing Bernhard Goetzke, whose look here would inspire the portrayal of Death in Ingmar Bergman's The Seventh Seal), who we soon learn is the personification of Death itself, in a small village. The deceased's grieving fiancee (Lil Dagover) confronts Death and implores him to bring back her lover. It's at this point that the anthology format kicks in, as Death spins three stories, placing the young woman in each and offering her a chance to alter their outcome and save her fiance, represented by an endangered young lover in each of the stories, which take place respectively in antiquated representations of the Middle East, China and Italy. All three stories boast some striking production design, and occasionally effects sequences that hold up quite well almost a century later, but with all three essentially telling the same tale, the film does become somewhat repetitive in this middle portion. Far more engrossing are the bookends, where Lang explores the concept of death, which European audiences of the time would have been sadly all too familiar with so close to the end of the so-called 'Great War'. Death takes the young woman to a room filled with flickering candles, a simple yet striking representation of the fragility of life, his bony hands passing over the vulnerable lights with the relative force of a hurricane engulfing a city. It's one of the great images in the filmography of a visual master. Remove the three stories from Der Mude Tod's middle and you would arguably have a more effective hour long meditation on the nature of death. 1921 audiences may have been won over by the spectacle contained in those sequences, but today they feel like an unnecessary decoration. Still, Lang's film is essential viewing for fans of both the director and wider silent cinema, and both should rush to catch this on a cinema screen in its newly restored glory. 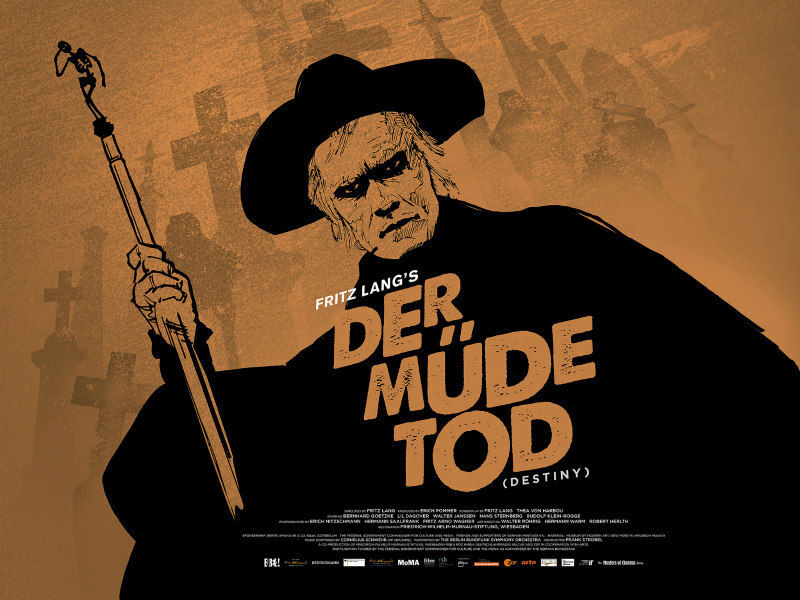 Der Mude Tod is re-released in UK/ROI cinemas and on Digital HD June 9th. It will later be released as part of the Masters of Cinema Series in a Dual Format (Blu-ray & DVD) edition on July 17th.